Have you ever wanted to try stencilling but don't really know where to start? Or maybe you've already given it a go but it hasn't worked out as you hoped? Stencilling is such a versatile art that it is worth getting to grips with. Some basic advice, based on some of the more common questions we get asked at the Stencil Warehouse, might be all you need to get started. Practice first! A piece of lining paper makes a good surface to try out your techniques until you're confident. Probably the most common mistake in stencilling is loading too much paint on to the brush or roller. This will lead to the paint seeping in under the stencil to give a ghosting effect. Build the colour up with a couple of light coats, working with an almost dry brush or roller. It's often helpful to use adhesive with your stencil. A very light application of a re-positionable spray adhesive on the back of the stencil will help to keep everything in place whilst you apply your paint. Lay your stencil face down on newspaper and spray lightly, from a distance. You shouldn't need to reapply every time you move the stencil. You are NOT trying to stick the stencil down and it's important not to use too much adhesive as this can leave a residue on the surface (although a light dusting of talcum powder will usually get rid of this). You can buy this at your local DIY or craft shop. The technique is more like smudging a colour onto a wall rather than applying paint. Go over the edges of the stencil, don't just try to apply the paint through the cut-out but work with your brush half on the stencil material, half on the surface, working your way over the whole stencil. This gives a great definition to the image making your finished project actually look like the design you chose! The surface you're stencilling on to is important. It must be clean, dry, and as flat as possible. A matt surface is always best, so if you're stencilling onto walls a matt emulsion is the best base. If you're painting your design on to other surfaces such as furniture you need a smooth matt surface, so either lightly sanded bare wood or a matt paint finish are ideal. Which paints to use? Acrylic paints (http://www.stencilwarehouse.com/acatalog/Acrylic-Stencil-Paint-Water-Based.html) are the most versatile. They have a high pigment content so will give good coverage, and they're good for lighter effects. For bolder and darker effects oil-based paint sticks are often better – these work particularly well on floorboards and furniture. Try both, then you can pick colours and effects you like for each of your projects. You can also use stencil creams, chalk paint or fabric paint. Think carefully about your choice of colours. If you're trying to match an existing theme pick just 2 or 3 colours to work with. Ideally use dark colours on a light surface, but dark surfaces and light colours can work well. Bright, bold colours may work well in a child's room, but actually the subtle colours will usually work better. Whether you use a brush or a roller may depend on the surface you're stencilling onto and the effect you want to achieve. Using a brush will give you more control over shading, but a roller is great for faster coverage if you're using acrylic paints, ideal if you're stencilling large flat areas and want a block colour effect such as for wall covering stencils. If you're stencilling on to furniture, floors or stairs etc you may need to varnish the finished design. Use a spray acrylic varnish if possible, easy to apply and won't go yellow with age as oil-based varnishes do. Again, this should be available in most DIY or craft stores. 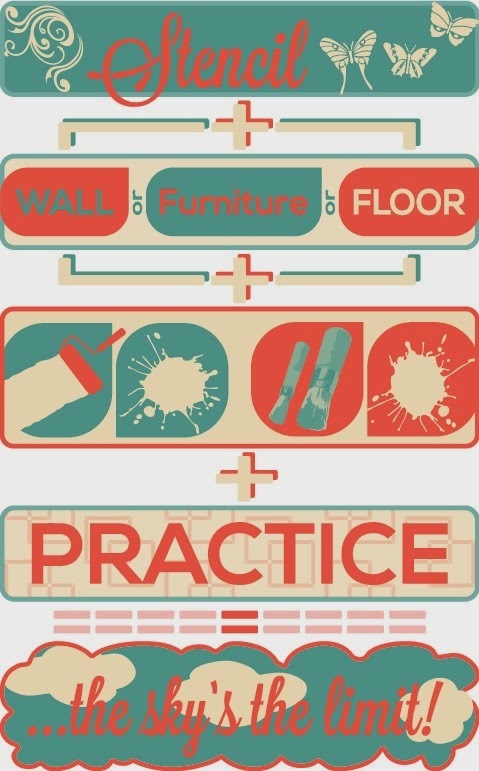 And remember, every stencilling project is different – putting a large repeat pattern over a whole wall is very different to applying a small intricate design onto furniture, so practice with different techniques, paints and surfaces and you'll soon get the confidence to tackle any project! Take a look at our range of decorative stencils and give it a go!